Does home advantage really pay? It's one of the questions that has long troubled sports fans and commentators and the world of rugby is no different. With the Six Nations around the corner, we have trawled the Statsguru archives to find out if playing on your own turf is as good as having a 16th man. The overwhelming conclusion is that France will in all likelihood come away from the 2012 Six Nations with the Grand Slam. Whether Les Bleus live up to their historical billing as favourites remains to be seen, but one thing is for sure when it comes to the Six Nations and that is the format. The fixture schedule ensures certain sides will enjoy the comforts of home on more occasions than their rivals in any particular year with that advantage flipped in the following year's Championship. It is France who have perhaps made the most of this opportunity. Since the tournament began in its new guise back in 2000, France have scooped three Grand Slams - 2002, 2004 and 2010 - and on all of these occasions, they were dealt a draw that saw them play three of the clashes in front of the Stade de France faithful. Add to this 2006, where France took the crown but lost to Scotland on the road, then you have four titles in six years - all secured with the help of their impressive Paris base. With France playing Italy, Ireland and England at the Stade de France in 2012, it would take a brave man to bet against them adding to their tally and the bookmakers have reflected this making them 7/2 favourites to achieve a clean sweep. These odds are further backed up by the fact that France have prevailed on Welsh soil five out of the six times they have played in Cardiff. With Ireland also hosting France this year - a place where France have won three of their six clashes - the odds are firmly stacked in favour of Philippe Saint-Andre's side. They also hold the record for most wins at home, alongside England, having been victorious on 25 of the 30 occasions they have played a Six Nations match in the familiar surrounds of Saint Denis. France currently hold the best winning record overall, with 44 wins in 60 matches - just one win better than Ireland - but it is England who can stand toe to toe with them based on home form. England's sole Six Nations Grand Slam came back in 2003 a year in which they too enjoyed playing three matches in front of their Twickenham faithful, with their two victories on the road coming against Wales and Ireland. Although currently trailing in the all-time stats in terms of Championship victories, they boast the same win percentage at home as France. With 25 of their 39 victories in the tournament coming on English soil, three of the red rose team's four Six Nations triumphs have come when enjoying a trio of games in front of their own crowd. But it is Ireland who buck the trend. They are the form side when it comes to winning matches away, having been victorious 19 out of 30 times. And their sole Grand Slam triumph came back in 2009 when they played just two matches on home soil with impressive wins on the road against Italy, Scotland and Wales. The feat of bringing home the Grand Slam having played just twice on home soil is only matched by Wales, who took their first clean sweep of the millennium in 2005. Wales have managed 16 wins on home soil out of 30 - with 28 overall in the tournament since 2000 - but they enjoyed home advantage on three occasions when it came to scooping their second Grand Slam in 2008. 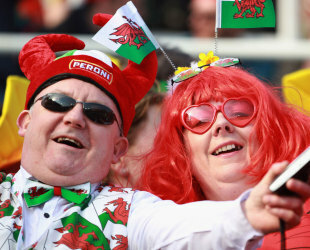 In this year's Six Nations, Wales host Scotland on February 12 - a fixture which has traditionally seen the Welsh prevail. Scotland have won just once in Wales since the tournament's inception back in 2000. And the Scots' record is not much better on home soil since 2000 with only 12 wins out of 30 matches. Ireland host Scotland this time around but Declan Kidney's charges have prevailed five times on Scottish soil in the past 12 years - a record which is also matched by France. While Ireland have won once on French soil, back in 2000, Italy have only prevailed once away from their home since the tournament's inception when they beat Scotland 37-17 at Murrayfield back in 2007. Italy's record in the tournament is fairly wretched but they are definitely a side who favour familiar surroundings with seven of their eight triumphs coming on Italian soil. So with the tournament just around the corner, the smart money is on France to prevail once again. History and statistics suggest they enjoy playing on home soil and with three of their five clashes in Paris, they look the favourites to achieve the coveted Grand Slam. But the beauty of the tournament is in its unpredictability, so while statistics paint a picture of dominance, there are five other sides all vying to prove them wrong.